Admiral Schofield’s 23 points propelled Tennessee to a 66-61 home victory over Georgia Saturday in their SEC regular season finale. The win gave Tennessee a share of the league regular season title with Auburn, their first championship in a decade. A Tennessee team picked in preseason polls to finish 13th wrapped a stunning surprise season Saturday in Knoxville, clinching a share of the Southeastern Conference Championship with a 66-61 comeback victory over the Georgia Bulldogs. It was their first time atop the league in any capacity since 2008, and the 10th time in their history they’ve either been champions or co-champions. Admiral Schofield had 23 points and Grant Williams 22, but the winning free throws came from Jordan Bowden, while Lamonte Turner had a trio of key second half three pointers. The Volunteers completed a 13-5 league season (23-7 overall) by also snapping a five-game losing streak to Georgia, whose regular season ended with a 7-11 conference mark (16-14 overall). They trailed the Bulldogs for over 30 minutes, but they held Georgia to only 19 second half points. “I love the way our guys fought there at the end and got it done,” UT head coach Rick Barnes told the Knoxville News-Sentinel. 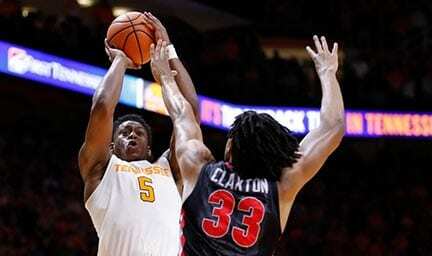 Now the Volunteers look ahead to the SEC Tournament which begins this week. But they won’t be playing until Friday, when they face the winner of the LSU/Mississippi State game. The Lady Vols weren’t quite so fortunate. Their quest for an SEC Tournament title ended in Nashville last Friday night, when the 12th ranked Volunteers were beaten 73-62 by sixth ranked South Carolina. Jaime Nared led the Lady Vols with 15 points and 13 rebounds, but also made only five of her 19 shots from the floor. The Lady Vols as a team shot less than 27 percent from the field (26.7), a season low, and also were unable to stop three-time SEC Player of the Year A’ja Wilson. Wilson had 24 points and 12 rebounds. The Lady Vols ended the season 24-7 and are now awaiting seeding for the upcoming NCAA Women’s Tournament. An otherwise dismal regular season for the Vanderbilt Commodores ended on a winning note Saturday in Oxford, as they defeated the Ole Miss Rebels 82-69. It prevented Vanderbilt from losing every road game this season. The Commodores shot 53 percent from the field, and were led by Jeff Roberson with 19 and Saben Lee with 17. Ole Miss and Vanderbilt both ended the year 12-19 overall, but Vanderbilt finished with one more league win at 6-12. Ole Miss finished 5-13. Vanderbilt began the SEC Tournament Wednesday with a first round game against Georgia. The winner of that contest faces Missouri Thursday. The Lady Commodores ended the worse season in school history last Thursday, being blown out 88-76 by Arkansas in the opening game of the SEC Women’s Tournament to finish 7-24 on the year.